Write about somebody whom you admire. Many people have their own idols, so do I! My idol is not very popular nowadays but I still like him. He is...Leonardo DiCaprio! 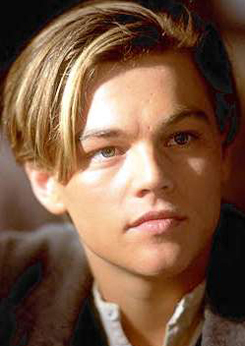 I've watched the movie "Titanic" a bazillion times, so I absolutely adore him! I know he is kinda fat now that he's old, but the Leonardo I admire is the 1999 Leonardo DiCaprio. It's not ONLY because he's handsome, it's because I love the tone and accent of his voice too! When he talks, it seems like your heart is being sucked into his eyes. Those beautiful eyes! Even though I might not be that fond of him as time passes, for now I still enjoy watching him on the big screen! Vivien, I LOVE Leonardo DiCaprio! He is one of my favorite actors, and it helps that he stars is my favorite movie, "Titanic." Did you get to see this movie in theaters? I have only seen it on DVD and would have loved the chance to see it when it was on the big screen. Hi Kayla! Nice to meet u! I have never seen "Titanic" in the theaters because I wasn't even born yet! We have had it in theaters again here in hk in 2011 but I didn't even know I would love it! I would love to see my favorite movie in 3D!